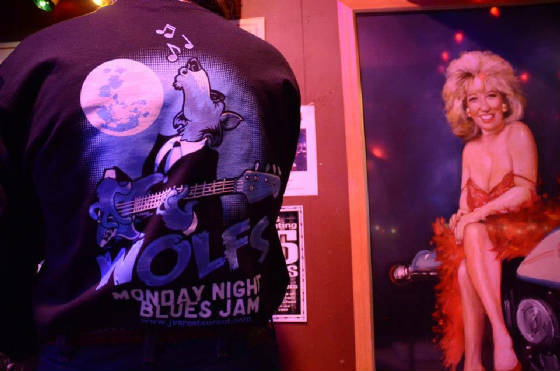 Get your JVs Wolf's Monday Blues Jam t-shirt - while supplies last! Wolf's been running open blues jams since 2004 and over those years has developed a system where things move quickly and smoothly, and at the same time keeping the musicians and audience happy and coming back for more. 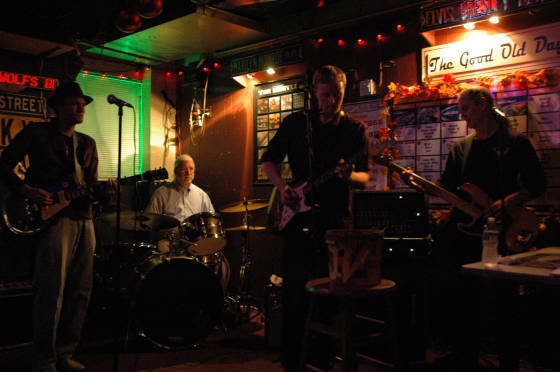 The jam events are "open blues jams," not open mics. (No solos, duos, singer songwriters, poets, comedy, etc.) Only Blues music performed in a band setting is permitted. Standard, simple 12 bar, 1-4-5 arrangements. The person singing gives the key, style (shuffle, rhumba, slow, swing, jump, etc. ), and provides necessary cues (i.e., stops and endings). Each soloing instrument plays a 24 bar solo during each song. 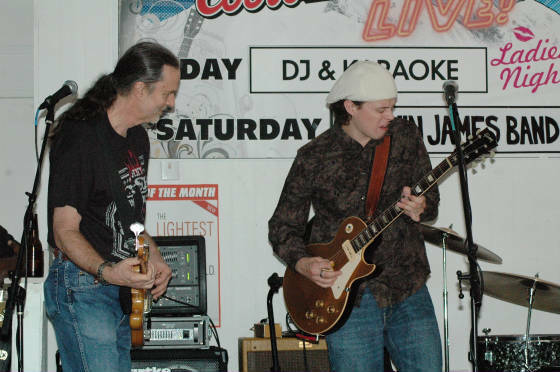 The host band provides guitar and bass amps and the basic equipment needed to hold the jam (drums, PA, mics, etc.). Guitar and harp players are welcome to bring their own amps if they prefer, but it is not required. The host band plays a warmup show set. Using the signup sheet, Wolf makes up jam sets consisting of a combination of host band members and local talent. Each jam set is usually 2-3 songs, depending on the number of musicians who have signed up. The jammers start signing up as early as an hour before we start and sign up continues throughout the evening. Wolf doesn't go straight down the list, but instead forms jam sets using the combination of players that will provide both the best possible music for the audience and playing experience for each musician. Getting there and signing up early means you're more likely to get up sooner and increases your possibility of more play time later in the evening. There are times, however, when the number of people who sign up is so large that people who arrive late in the evening may not have the opportunity to perform. Great way to hear local blues talent, and you never know who's going to show up: sometimes out-of-towners and touring musicians. Of course it's also a great way to connect with other blues-lovers and musicians. Great way to meet potential bandmates and potential fans too! Tips for the house band are encouraged and greatly appreciated! The house band usually provides the equipment for the jammers. Most of the house band musicians drive a great distance and the tips really help them out. Eugene Hideaway Bridges, one of the headliners for the DC Blues Festival, jamming w/Big Boy Little! Wolf & Robert Frahm at Wolf's Wednesday jam. Est. 2004. Wolf's Monday blues jam at JVs Restaurant (pre-expansion)! Est. 2010. "Hosting a blues jam could be compared to herding cats, so why not put a wolf in charge to keep those cool musical cats under control?" www.facebook.com/wolfsmusicweekly - lots of pics!